William Shakespeare said: “The eyes are the window to your soul.” You can tell a lot about what a person is thinking or feeling by looking at their eyes. 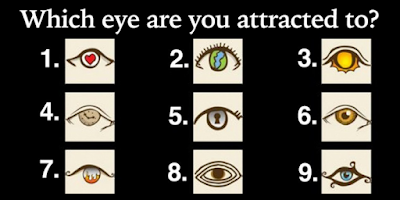 Take a look at the image and choose the eye to which you are most drawn. Don’t over-think it; just pick the eye that draws you in the most. You’re the open, kind spirit. You welcome everyone into your life, whether it walks, slithers or crawls. You prefer to take risks and get hurt than to keep yourself locked away. Helping others is a high priority for you. You’re the conscientious one. You’re always looking to do the right thing for your community and the world. You know your actions make a difference, even if they’re small ones. You believe that activism is the rent you pay for living on this planet. You’re the troubled one. Your past was likely tumultuous and still impacts your life today. You might feel like life is a sick joke being played on you and struggle to find peace in this. Despite this, you’re capable of picking yourself up when you fall and can have a sunny disposition. You’re a point of light in a demon-haunted world. You’re the philosopher. You look for deeper meaning in things but are still comforted when something can be taken at face value. You’re confident in your ability to solve the puzzles of this life. You may not figure it all out, but that’s alright. You’re the mysterious one. You haven’t figured yourself out yet, which makes you fairly enigmatic to the people around you. You don’t mince words and are a person of action. You don’t speak unless you’re certain of what you say. You’re more of a sensitive, thoughtful person. You notice the little details and rarely forget anything, even if it’s something silly or pointless. You’re fragile but you never show it. You have a strong intuition and often are the first to see trouble ahead. You’re a fiery spirit. You’re energetic, passionate, and perfect for leadership roles. You wear yourself on your sleeve and are very opinionated. You’re thrilled by anything high stakes. You’re the crazy one. You have unusual interests, practices, and systems of belief. You were probably called a weirdo as a kid. Don’t sweat it, these may seem like insults but they’re what make you special. You laugh off tradition and never conform. You’re the intuitive one. You understand people, cultures, and the whole world well. You can read people like a poem and know when you’re being lied to. Your every action is measured and you don’t manipulate easily. At the same time, you can play puppet master well, though we don’t recommend that kind of behavior. So, what do you think? Is it accurate for you?